The MedPlanner Medicine Organizer neatly and discreetly corrals medication, medical devices, and other healthcare essentials. 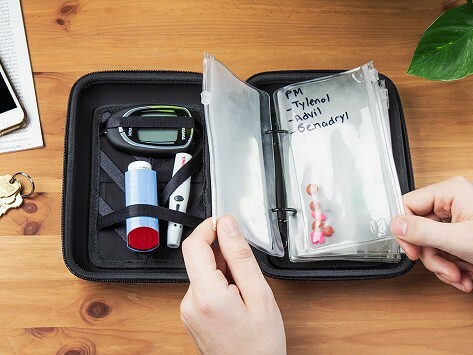 The hardshell, ringed case holds seven zip-top pouches (that you can write on) and has a stretchy grid that work together to organize medication, vitamins, or small devices like an inhaler, EpiPen, or insulin. An easy-open loop was made with folks with dexterity issues in mind. Dimensions: 8" x 7.75" x 2.75"
This is a wonderful invention for those who have medicines and travel but also just for organizing it all in one place. Mine is scattered all over so wgen packing for travel its a chore to father together and hopefully I won’t muss anything in the process. Love your items very much!! Used this on a trip and found it very helpful. I have several medications per day and the plastic sleeves were easy to pack, access, and seal. This would be great for traveling with chained necklaces, etc. A more colorful color would add to the fun of it. I take meds AM and PM. With bags divided in half, I could pack a bag for each day with them divided for morning and night.